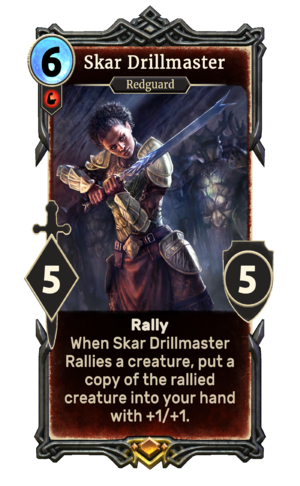 Skar Drillmaster is a legendary Strength creature card. It is part of the Houses of Morrowind expansion. "Welcome to House Redoran, recruit." This card's ability applies the Trained card effect. The card depicts Neminda, the drillmaster of House Redoran.